It is easy to get lost in finals preparation or in the winter weather and to forget about the little things. This is why December’s Dorm Energy Championship theme is vampire energy. 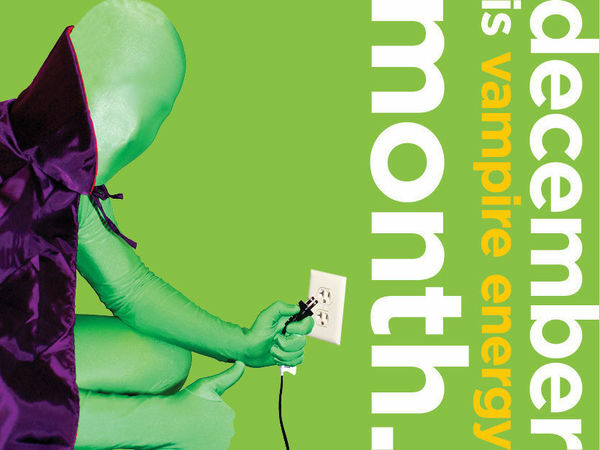 Vampire energy, or phantom load, is the electricity that is used by devices that are plugged in but not in use. Devices like microwaves, videogame consoles, TVs, and stereos can all waste vampire energy. In fact, any devices that have lights, clocks, or are remote controlled are sucking up energy whenever they are plugged in. Vampire energy is more significant than you might think yet is easily overlooked. Vampire energy accounts for approximately 5% of the average household’s energy consumption, though this figure is highly variable. In particular, dorm rooms that feature many different entertainment systems will generally have higher phantom loads. Fortunately, vampire energy is easily defeated by plugging devices into a power strip and diligently turning the strip off whenever those devices are not in use. “I try to target groups of electronics that can easily be plugged into the same outlet”, said Kate Christian ’15. “By plugging my stereo, TV, and Xbox into the same power strip, I was able to eliminate vampire energy and get organized.” Turning off power strips and unplugging devices is especially relevant this time of the year, as students head home for winter break. November’s Dorm Energy Championship theme was laundry. Campus residents were able to save 37,365 kWh of electricity, which translates into roughly 52,311 pounds of avoided carbon dioxide. These efforts have also saved the university approximately $1,868 dollars. This month’s winners will have the opportunity to assign their green points they earned in November at the upcoming commissioner meeting. Originally published by Robert Coly at green.nd.edu on December 04, 2013.